GT Fish and Oyster, named after chef Giuseppe Tentori, is a seafood specialty spot in the river north area of Chicago. The decor and design of the restaurant’s interior is both upscale and laid back at then same time. This is indicative of what I hear from Chicago based chefs and staff time and time again particularly when faced with the New York – Chicago question. They maintain (and I would tend to agree) that Chicago has all the culinary muscle of NYC with a generally more laid back attitude. 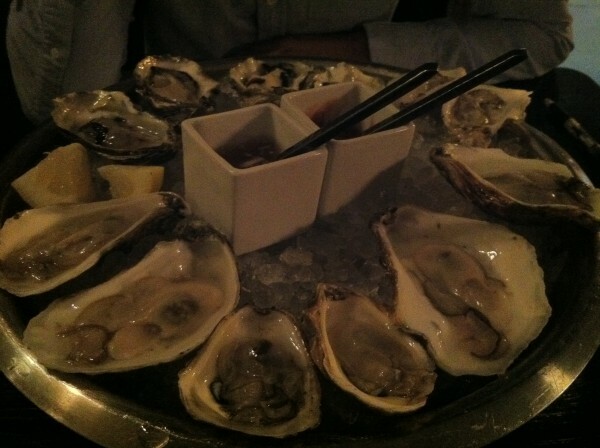 The oysters were fantastic and very fresh. They were organized in a “clockwise fashion” by type and sweetness which was a really nice touch. Along with the traditional oyster sauces we were also served with Giuseppe Tentori’s very own hot sauces – Burn and Smoulder. We washed the oysters down with a recommended drink from the cocktail menu and a pint of Matilda from Chicago’s own Goose Island Brewery. Our first cocktail choice was The Waitlist which is Grey Goose, St. Germain, Grapefruit, Lime, Peychaud’s Bitters. The Matilda, which won a gold medal at the 2011 World Beer Championships in the Belgian style amber ale category, tasted spicy and smelled fruity. The Waitlist was expertly blended and tasted great. With the help of our waiter, we ordered these dishes to share between the two of us. The hamachi crudo was clean and simple, with a lovely play between the spicy habanero and the classic citrus flavors. 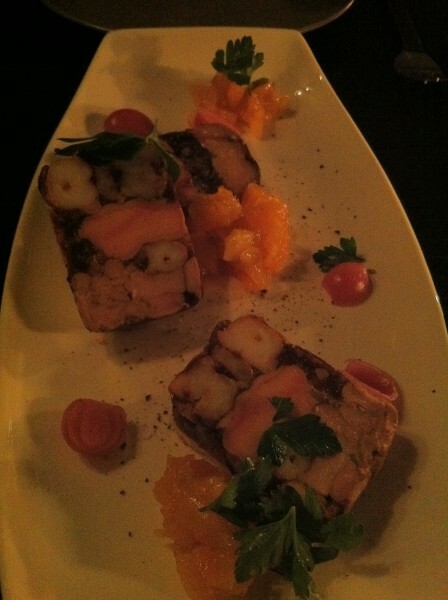 Our favorite dish of the night was the foie gras and shrimp terrine. I find a lot of restaurants serve disproportionate amounts of foie in most cases but this dish had a perfect balance. The sweet apricot chutney smoothed into the unctuous foie perfectly – not to mention how beautifully the dish was plated. The Oyster Po’Boy Slider was a very clever korean take on the classic Louisiana sandwich. Before this I had only tasted deep fried oysters at Chinese restaurants and I quite liked this take on it. Before moving on we ordered another Matilda and a Old Money which is Black Maple Hill Bourbon, Aperol, Nux Alpina Walnut Liqueur and Allspice. The heaviest dish of the night was the Striped Bass which was served on a bed of red pearl onions and sweet breads. The pearl onions were roughly the same size as the sweeet breads which added an interesting visual dimension to the dish. The bass was soft and covered in salsa verde – the pairing with sweet breads was a first for me and it worked. A mouthful of sweet breads with pearl onions tasted like a great dish on its own as well. Although we were stuffed we decided to honor the meal by ordering a banana caramel tart and a citrus inspired dessert. There are only a handful of restaurants that left me with such good memories – we left with our stomachs full and feeling like we had made some new friends. A must for anyone in the Chicago area. Thanks to Patrick for the wonderful service and great conversation. Tags: Beer, Chicago, Cocktails, Dinner, Foie Gras, forkandtell, GT FIsh & Oyster, Hamachi, Lemon, Oysters, Raspberry Point, Shrimp, Striped Bass, Sweetbreads, Tuna.